I can’t believe he’s beating the likes of Ed Clancey now, this kid is on fire! Great Britain’s Matt Gibson took an excellent victory with a late breakaway at the third round of The Pearl Izumi Tour Series in Peterborough on Tuesday. The 17-year-old attacked from a four-rider lead group on the last lap with Adam Blythe coming in second, ahead of Graham Briggs and Mike Northey. With Felix English and Ed Clancy leading in the bunch for fifth and sixth, Rapha Condor JLT took their second win of the 2014 series to move into a three-point lead at the top of the standings. Madison Genesis, who placed four in the top ten, took a close second to remain in runners-up spot. Gibson, Blythe, Briggs and Northey had gone clear midway through the hour long race on The Pearl Izumi Tour Series and worked well together, building and maintaining a lead of over 30 seconds on the peloton. Then with the bell ringing to herald the last lap, Gibson – fresh from a time-trial stage win at the Course de la Paix – jumped clear and instantly built an unbridgeable margin, which held all the way around the 1.1-kilometre lap. Behind the celebrating Great Britain rider Adam Blythe crossed the line alone for his best Pearl Izumi Tour Series individual result to date, with Briggs and Northey crossing the line by themselves. Northey was third on the road, but was relegated behind Briggs by commissaires after the two clashed in the final corner. Behind clear the clear 1-2, NFTO took third to keep them in the Pearl Izumi Tour Series title hunt, while Great Britain could only come sixth, despite taking the individual win. NFTO also kept hold of the Sprints jersey thanks to Jon Mould, who earned enough points to keep him six points clear of Briggs, with Northey winning the evening’s sprint prize in Peterborough. In the Matrix Fitness Grand Prix Series, Eileen Roe moved into the lead with victory in round two, ensuring she will wear the leader’s jersey on home roads in Scotland at round three. In the absence of opening round winner and leader Katie Archibald, Roe had pulled on the red and white Matrix Fitness jersey in Peterborough as the leading rider racing, and did the jersey proud, firstly attacking and then ultimately winning the final sprint ahead of Nicola Juniper and Harriet Owen. Roe now heads a Scottish 1-2 ahead of Charline Joiner as the women’s series heads to Scotland for the first time in Edinburgh on Thursday 29 May. Victory was Roe’s second in the series, having won the Colchester event in heavy rain in 2012, but this time victory means she takes control of the series, with an 11-point lead over Joiner. Highlights of round three from Peterborough are shown on ITV4 at 8pm on Wednesday 21 May, with a repeat at 9.55am on Thursday 22 May. Round four of The Pearl Izumi Tour Series visits Wales for the Aberystwyth round on Friday 23 May. A great race for the junior’s finished with a fine two-up break featuring our own Matt Gibson in pursuit of the yellow jersey. 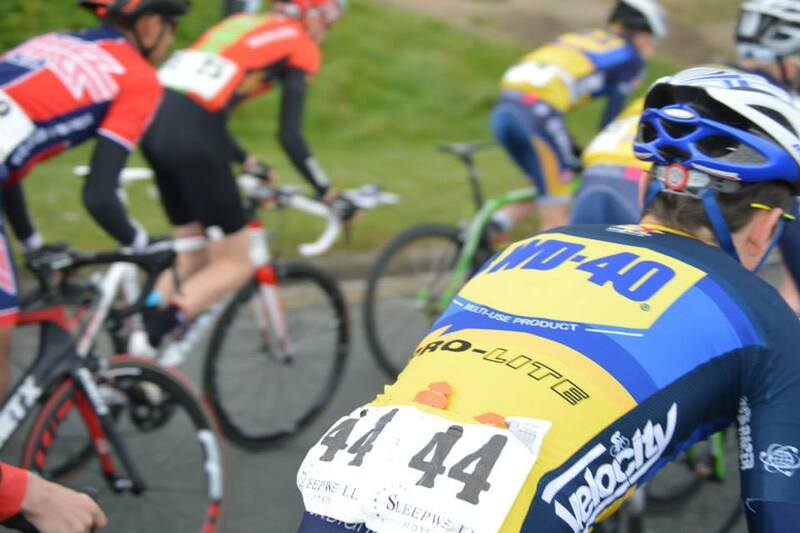 Matt took an excellent stage win 20 seconds in front of the main bunch, which contained all our other riders. That was Matt’s second stage win of the weekend. Unfortunately, that left Matt just 10 seconds short of the overall win, but in an excellent 3rd place overall. The other boys had been in EVERY break on EVERY lap making Haribo Beacon chase them all the way. Saturday’s stages of the Junior & Youth tour of the Isle of Man were as challenging as expected. 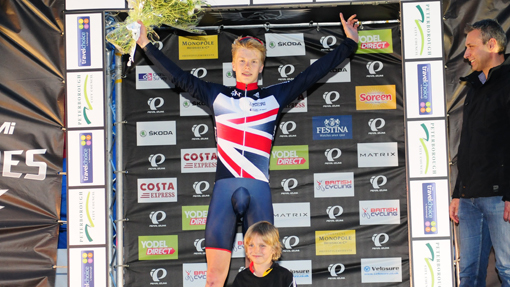 In the juniors Matt Gibson could not defend his yellow jersey. Jack Escritt got into the decisive break but was the victim of a crash. Ben McIntosh, Fabian Brennan and Alex Braybrooke chased hard, with Matt taking over the work later on and brought the gap back to around 40 seconds. Matt is 6th in GC. In the youth race Matt Walls is in the top 3 and having worked hard over every climb Adam Hartley is in the green jersey.